We developed the lapstrake plywood Cape May 25 from the Cape Cutter 19, a GRP trailer sailer that became popular in a short time and sold 70 boats in its first 2 years in the UK market. The 19 proved to be a boat that is full of character, able and seaworthy, with a surprising turn of speed. Well over 100 have been built in GRP and we have sold plans for another 60 boats to be built in plywood by amateurs. We followed that design with the Cape Henry 21, a slightly bigger sister that still fitted within standard towing width in most countries but offered a bit more space and comfort for a small family. We have sold more than 70 of them for building in plywood by amateurs. There have followed many requests for other sizes within this same concept. I have been working on a 32ft version, the Cape Charles 32, which will happen when time allows and which will make a great cruiser for the Bahamas, Caribbean and similar areas with limited depth. The Cape May 25 is an intermediate design, with more space than the smaller sisters but still intended for a small family of Mom, Dad and two kids. My client is nearly 2m tall, so extra long berths were a must. The foreward berths are 2.2m long and have plenty of foot room for two people. I kept it as one very big double berth rather than making a pair of V-berths so that it will have masses of storage under it for sails and gear, with space left over for a water tank and holding tank if needed. The rope locker in the bow adds to this stowage space and the bulkhead also serves as a crash bulkhead. The hull is styled after the traditional sailing craft of England, which have spawned many modern interpretations of the basic concept. It is lapstrake plywood in construction, with carefully proportioned curves and strake widths to produce a pretty hull. In lapstrake hulls the chines are accentuated by the step in the joint, so an unfair line looks very ugly. When I was designing the Cape Cutter 19 I found that I could easily fair the chines in my CAD programs but had problems visualizing the proportions of the panels relative to the overall profile and each other. I did not feel confident of producing a hull that would look good from all angles, so I returned to the old steam powered drawing board to draw the basic lines. After that I went back into the CAD programs for minor tweaking of fairness and to produce 3D rendered images so that I could look at her from all angles. The result was a boat that is attractive from wherever she is seen. The bigger sisters have benefitted from that process by being directly scaled up from that original set of lines. The Cape May 25 is built over permanent plywood bulkheads and has a plywood backbone that runs from the stemhead through to the start of the centreplate case. The backbone and bulkheads interlock into each other egg-crate fashion, making set-up an easy task. This backbone provides longitudinal stiffness to the forward part of the hull. 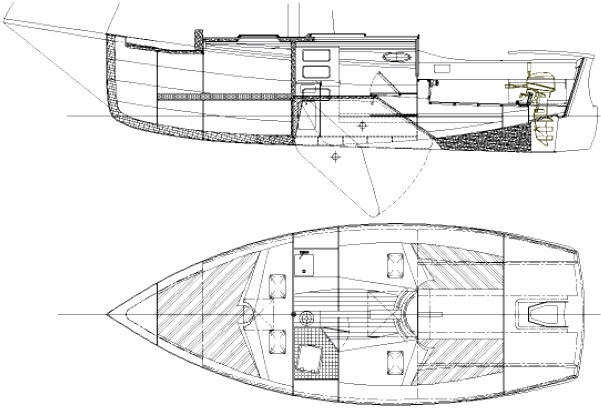 The centreplate case and a solid timber shallow full keel, which runs through to the engine well against the transom, provide stiffness to the rest of the hull. This hull is also stiffened structurally by stringers at all chines. Although epoxy filleted and glassed joints would have done the job, it is more difficult to build that way due to the panels flexing while shaping is being done in preparation for the next panel to be fitted. Professional builders have probably got work-arounds for these situations but my concern was to make the job as simple as possible for inexperienced builders. I have detailed stringers at all chines, which give a firm base on which to work when shaping and fitting panels. They also supply a fair line for establishing correct shape and fit of the panels. Another concern was that a stringerless joint has the strength to withstand the pressures applied by the sea on the outside but not potential loads applied from the inside. A heavy person flopping down against the hull when using the quarter berths as seats can load the joint so that it cracks on the outside, with potential leak and future structural problems. A layer of glass on the outside of the joint would strengthen it but is not a simple task on a lapstrake detail. I chose the stringer as the more user-friendly option. Firm cushions fitted between the stringers from galley to cockpit will allow this area of the quarter berths to still be comfortable as seats. The interior follows a similar arrangement to the smaller sisters but it has an enclosed heads compartment that can either have a door or a curtain to screen it off. There is space for either a chemical toilet or a compact marine heads. The interior of the centreplate version is split by the centreplate casing. 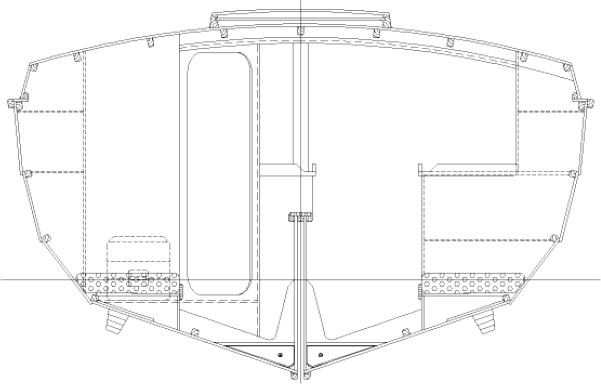 We will also be introducing a fixed keel version with a shallow cruising fin keel and a clear saloon cabin sole. The hull has good performance characteristics. It is almost all waterline length, a sure way of improving speed for a given weight under most sailing conditions. It is fairly fine up front at the first chine, with a hollow to the curve of the waterline. This gives good penetration to punch to windward through waves and wind chop. Flare to the upper sections and a broad forward deck give reserve buoyancy for dryness and decent interior accommodation. The rig shows two headsails, being a Genoa and a Yankee, as well as a staysail. 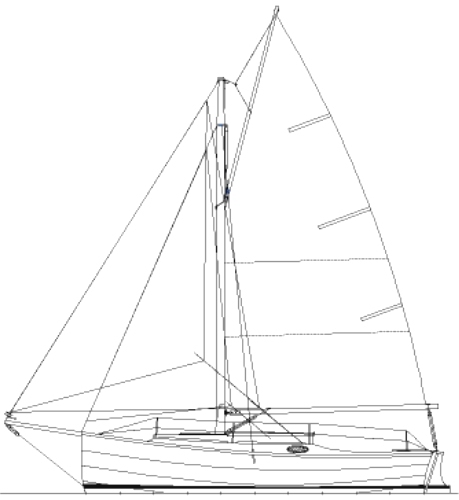 The Genoa is intended to be used without the staysail and the Yankee would be used with the staysail. Genoa and Yankee have luff wires and roller furlers that are easily removed from the bowsprit for folding. The bowsprit is hinged on the foredeck so that it can be folded aft to lie along the deck when not in use. This is most likely to be done for access to tight moorings and for trailing. The main forestay is the one to the stemhead, so she can be sailed with the bowsprit shipped. The mast is hollow timber, fabricated by the birdsmouth method. The boom is goose-necked to the tabernacle rather than to the mast, allowing the mast to be dropped without removing the boom. The mainsail is a high-peaked gaff, which gives good efficiency without a topsail. The low aspect nature of the sail plan allows her to carry a lot of sail, more than is normal for similar size cruisers with more modern rigs. The result is surprising performance in light to moderate conditions. We include full size Mylar patterns of the bulkheads with the stock plans, to assist those building from scratch. We also offer optional Mylar patterns of the hull panels, useful for those builders who are concerned about cutting the correct shapes for the hull skin. Most builders who take on this project will learn some new skills along the way. That is one of the reasons why we build our own boats rather than buying. Any handyman of reasonable ability should be able to produce a Cape May 25 of which he will be proud.